When cricket became confused with a fancy dress party, no one knows exactly (especially not nightwatchgirl), but come every Saturday of a Test match (though there is no law limiting this to one specific day or form of the game -just to warn you), people all around the ground will be wearing some disguise or other. And as with all dress-up associated outings, it is the journey to the intended destination that is the embarrassing part. Once sitting down in the ground, it seems that this self-awareness is forgotten, as they happily merge in to the crowd and get on with the intended duty of watching cricket dressed up as the Pink Panther or similar. Most recently, a favourite has been Amy Winehouse (beehive wig, white vest, tattoos drawn on the arm, extra eyeliner), a seemingly easy, yet effective costume (and probably quite cheap). But it is also equally common to see pirates, beekeepers and cavalier knights (no, there is no link to the cricket - silly you, but sometimes that's the point). Even at today's game, a bride and groom made an appearance (both men), in a lovely white wedding dress and morning suit. Nightwatchgirl has also had the pleasure of sitting with a gang of spidermen, and luckily for her, got to sit next to a man dressed as spiderwoman (no, it was not a pretty sight - skirt and all, oh the shame). A special mention must be given to those men (as they always are), who seem to have become suddenly so organised, that they have t-shirts specially made, each with a single letter printed on the front. This very cleverly spells out a word (oh the wit). Commonly: Freddy (after Andrew Flintoff), or Monty or something else equally brilliant (nightwatchgirl's vote: tryhard). The highlight comes when the beer drinking and toilet-going outweighs the need/effort to sit in order, and the group end up spelling nothing at all, but look pretty ridiculous (and drunken). England have had a mixed day with the bat. It had started so well this morning with Alastair Cook and Ian Bell returning to the crease, after seeing off the South African attack of yesterday. But as with all good things concerning England of late, they come to an abrupt and disappointing end, and Ian Bell was out in the first five minutes of play. But it wasn't all bad. 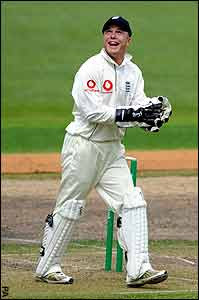 Kevin Pietsersen secured his first century as England captain at the first opportunity. 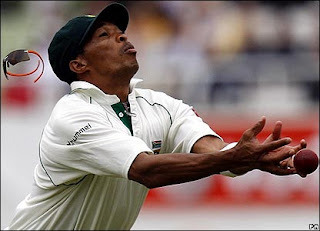 But his obvious jubilation provided the perfect distraction for South Africa to get him out with the very next ball. Paul Collingwood, making a well-earned 59, succumbed to Kallis, who also dismissed Flintoff and Ambrose. Harmison's efforts at the end of England's innings was exactly what the doctor ordered - batting with sheer abandon, and seemingly without a care in the world, making his top score of 49. The South African innings began with a dream start for England as James Anderson trapped Graeme Smith LBW in the first over, leaving the score 0-1. But Amla and McKenzie managed to avoid any more mishaps, and the score at end of play 37-1. England must also be wary of the weather forecast (nightwatchgirl realises she's on shaky ground discussing the weather). Heavy rain is heading for London tomorrow, and with a lead of 85 runs, England are the team who are under pressure and in need to hurry this game up if they are to secure their first and only win of the series. Tomorrow will be a big day. Stay tuned. Steve Harmison and James Anderson were able to wreak havoc on the top-order of the South African batsmen today, as South Africa slumped from 102-1 to finish all out for 194. After previous tests seeing partnerships last 200+ runs, England made a huge improvement in the field. The responsibility now lies with the English batsmen backing up the efforts of the bowlers. Harmison's comeback to the Test side was almost too good to be true as he ran in to bowl to Ashwell Prince on a hat-trick. All five English bowlers managed to get on the scoreboard after tea, with Monty Panesar and Stuart Broad also getting in on the action. As the sun shone down on the Oval, England looked in the field like a side fighting to ensure South Africa don't go home with a whitewash under their belts. Morne Morkel was so disorientated after being dismissed by Stuart Broad that he walked off the field to the Groundsmen's shed (perhaps he was trying to hide from his team). England inning's started with a blip as Andrew Strauss was once again out cheaply, giving Ian Bell, with his endearing sneery-Elvis lip, his first chance to try batting at number three since the end of Michael Vaughan. Strauss' wicket, unfortunately, allowed South Africa back in to the game that had arguably been mostly England's. But Bell and Cook batted well to see off the end of the day's play, leaving England on 49-1. Nightwatchgirl also realises with hindsight that her skills as a meteorologist are, like her weather predictions, utter rubbish (see previous post) as the sun shone almost constantly for the rest of the day. Hat-trick - three wickets in three balls. In a row. Extremely rare occurence. Partnerships - between batsmen at the crease. The bigger the better. Whitewash - To lose a whole series without winning one Test. England continue to favour those with a South African birthplace, with the announcement that Matt Prior is to replace Tim Ambrose (technically Australian by birth) as wicketkeeper for the One Day International series against South Africa. The England selectors are starting to resemble a kid in a candy shop. What England need is consistency, not a merry-go-round (Pattinson, anyone?). Prior, who has played 22 ODIs with an average of 21, has been recalled most likely due to Ambrose's paltry batting of late. But, nightwatchgirl must ask, why not give him a bit more time? Ambrose has only played five ODIs. One-night-stands have lasted longer. Poor Tim. And he looks so hopeful too. Perhaps if he'd played for Sussex like Prior he would be slightly better favoured by the coach (wait, was Peter Moores coach for Sussex, wow small world....?). An opportunity has arisen for a prestigious position as both manager and leader in a media-related post. Must like lots of travel, coin tossing, saying hurtful and mean things under one's breath, catching, throwing and occasionally hitting some different coloured balls, a bit of running, sun exposure and wood. Air miles, pedalo hire and jellybabies included. No holidays allowed to India during slogging season. 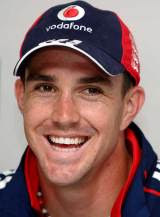 After probably the worst kept secret in cricket history, Kevin Pietersen was handed the England captaincy today. And yes, he's smiling now, but for how long will that cheesy grin remain? 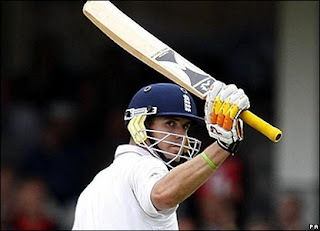 Pietersen has remained an enigmatic cricketer. His previous innings have shown a player who can take a game away from the opposition, create panic, even force an ICC meeting about his left-handed shot. His downsides are that he is too brash, all too often throws his wicket away, and at certain points can't even catch a ball. But the question remains, can he cope with the captaincy? Nightwatchgirl is undecided. 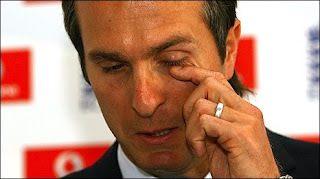 Michael Vaughan resigned today as England captain, after losing the third Test against South Africa, and with that, the series. Vaughan, with an average of just 8.00 runs for the series, felt today was the day to end the speculation and stand down. No one can argue that he has been short of runs and has looked like a deer stuck in the headlights of the South African bowlers. The important question facing English cricket now is who is the best man for the job. The poisoned chalice appears to have been handed to Kevin Pietersen. Some would argue that the responsibilty that goes with becoming captain can make or break a player. For Vaughan, who had a good four years; winning series after series, winning the Ashes, the eventual toll has been his batting. His captaincy has rarely been called in to question (save for a few dodgy selection decisions - Pattinson, anyone?). Flintoff had a good crack, but faced with a bitter and resurgent Australian team in 2006, could not provide that winning formula. With the Ashes looming over the horizon of 2009, has Michael Vaughan abandoned a job that only he could do, and beat the Australians again on home soil? Pietersen has no record as a skipper. His vice-captaincy of the One Day side is all very well, but do we judge Harriet Harman for Gordon Brown's mistakes? The test will come, if and when he is chosen, with the final game starting at the Oval, August 7. There his selection, field placing, strategy and confidence will decide if he has what the England team needs. If the answer is in the negative, who can and will England turn to? England are lost at sea, without a skipper, sailing round in circles and with no map and compass.